Ready to paddle along on Bear Lake then take a short hike to Sol’s Creek Falls and on to Flat Creek Falls from the lake too. The picture of flat creek falls. We will attempt to get to both falls from the lake. Total hiking distance 2 miles. We will rent from Bear Lake Rentals. To get your bearings, reference a start near the dam end of the lake. The headwaters of the lake are in a SE direction. The lake has an added feature of several streams which flow in and the two waterfalls nearby. After paddling up the main channel to the lake you will arrive at a small island with a large rock. The lake comes to a T at this point turning right will take you to a small cove with a heavy flowing stream. Creek Falls. You can paddle to the mouth of the creek and pull out on a sandy beach. There is a crude (seldom used) foot trail which runs along the creek up to the falls. The hike is well worth the time and brings you to the base of the falls in about 3/4 mile. The falls are on National Forest land. 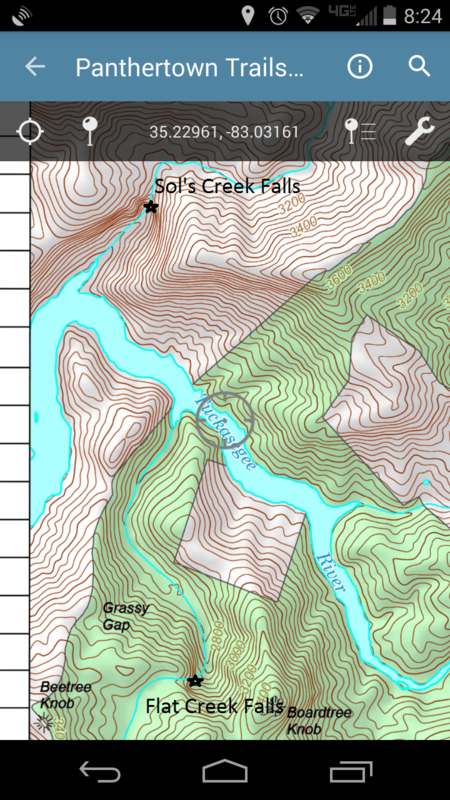 Once we’ve left Sol’s Falls we will navigate to Flat Creek Falls, it is lined by mountain laurel, Catawba rhododendron, and Rosebay rhododendron which bloom at various times in late spring and early summer. Pictured here is the relative location and it’s about a mile and a half. We also will try the road and trail to the top another day!